Almo Nature have created 'Daily Menu Bio Paté for puppies. All products from this range come from certified organic farms, meaning this paté is 100% organic. This paté contains natural ingredients that are appropriate to the needs of the young dog. Almo Nature have created Daily Menu Bio Paté for puppies. All products from this range come from certified organic farms, meaning this paté is 100% organic. This paté contains natural ingredients that are appropriate to the needs of young dogs. 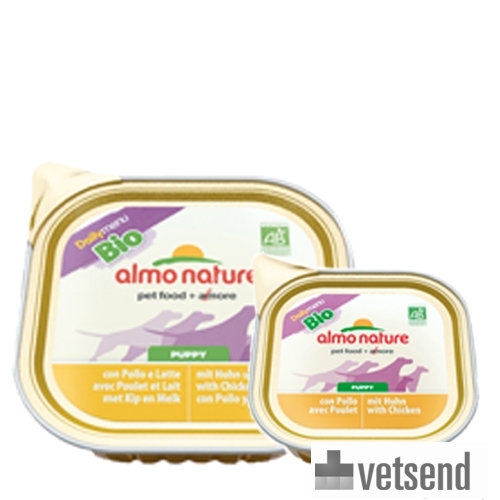 Almo Nature Daily Menu Bio Paté Puppy contains no flavour enhancers, preservatives or colourings, and no chemical residues or pesticides have been added. This tasty paté is healthy and safe for puppies and also helps you contribute to the environment. Daily Menu Bio Paté - Puppy is available in a chicken-milk flavour which comes in packs of 32 cans of 100 grams, or 9 cans of 300 grams. Meat and meat derivatives (at least 5% chicken), milk and dairy products (at least 4%), vegetables (at least 5% peas and carrots), cereals, minerals and Vitamin E.
Have you used Almo Nature - Daily Menu Bio Paté - Puppy before? Let us know what you think about this product.